Oscar Valdez dropped Tommasone down for 4th time in the fight 9 seconds into round 7 and referee waves it off straight away. 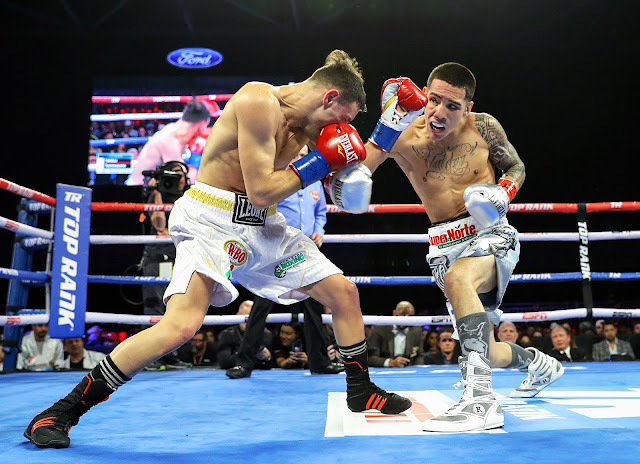 Valdez retains his WBO Featherweight World title and moves to 25-0. Before the stoppage, Valdez dropped the previously unbeaten Tommasone three times, in the sixth and twice in the fourth round . Walking Tommasone down, cutting off the ring. Tommasone was actually tough guy. Tommasone was basically outmatched by the champion and just as expected, retained his WBO Featherweight World title in style.